Menopause marks the time of a woman’s life when her body transitions from a state of fertility to one of infertility. During the year after a woman's last menstrual period, her ovaries stop releasing eggs and producing estrogen. Although a natural progression of life, menopause and the period following menopause, known as postmenopause, bring increased risk of chronic diseases, including heart disease and osteoporosis, because of the decrease in hormones. To fight the onset of osteoporosis, postmenopausal women should take more vitamin D and calcium. Bones consist of collagen, the protein that provides flexibility, calcium and other mineral deposits that provide strength and living cells that continually remove and replace old and weak bone tissue. As you age, the rate at which old bones break down increases, while formation of new bone decreases. 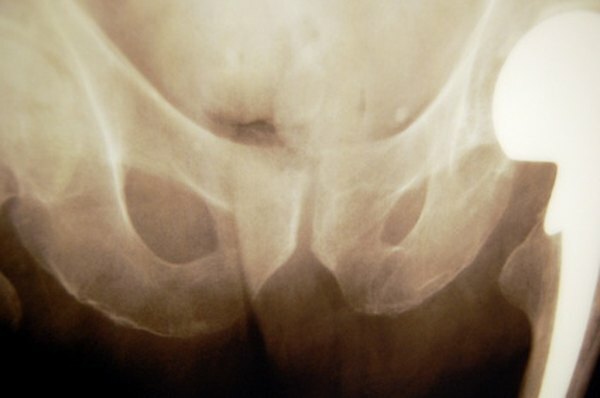 This leads to osteoporosis, characterized by porous and weak bones. Many women lose up to 20 percent of their total bone mass in the five to seven years following menopause, according to the National Osteoporosis Foundation. Since vitamin D promotes the absorption of calcium and calcium helps to build new bone, increasing your intake of these can help stimulate the formation of new bone and slow the progression of osteoporosis. Vitamin D, a fat-soluble vitamin, occurs naturally in very few foods, with fatty fish like salmon or tuna, fish liver oil, beef liver and egg yolks serving as the best food sources. To decrease the occurrence of vitamin D deficiency syndromes such as rickets, food manufacturers fortify foods including milk, cheese, orange juice and breakfast cereals with vitamin D. Your body can also produce vitamin D when the ultraviolet rays of the sun stimulate the conversion of previtamin D-3 in the skin cells into vitamin D. As women age, their skin loses the ability to produce vitamin D, making postmenopausal women a high-risk group for vitamin D deficiency. The human body stores approximately 99 percent of its calcium in the bones, but still needs calcium for other functions including muscle function, nerve transmission and the contraction and dilation of vascular tissues, including the heart and blood vessels. When calcium is deficient, the body removes calcium from the bone to fulfill other functions, which contributes to the breakdown of bone. Since a lack of estrogen enhances the rate of bone loss, a postmenopausal woman must take more calcium to promote the formation of new bone. Many foods contain calcium, including low-fat dairy products and green leafy vegetables like kale, cabbage and spinach. Women who don't get enough calcium from their diet should take a supplement. Postmenopausal women, especially those older than 70, should increase their daily vitamin D intake from 15 micrograms, or 600 IU, to 20 micrograms, or 800 IU, according to the National Institutes of Health Office of Dietary Supplements. The National Osteoporosis Foundation recommends even higher daily intakes of 800 to 1,000 IU of vitamin D. Since the Institute of Medicine sets the tolerable upper intake level -- the maximum amount of a nutrient likely to pose no health risks -- at 4,000 IU per day, women can safely take these increased amounts. Postmenopausal women should increase their calcium intake from 1,000 milligrams per day to 1,200 milligrams per day, according to the Institute of Medicine. If taking calcium supplements, be sure not to exceed the tolerable level of 2,000 milligrams per day. Check with your doctor before adding any supplements to your diet.